An adobo is a specific type of puréed chile that is blended with herbs and spices. An acidic ingredient lifts the flavors. All adobos depend on chiles as the central flavor, so keep in mind that you’re going for the flavor, not the heat. For this reason, always remove the seeds and the membranes in order to get rid of the, capsaicin, the heat-producing ingredient in chiles. Traditional adobos use chiles, seasonings and an acid as a base. Interestingly, most US barbecue sauces are based on the general adobo principle, since they all use chiles. But they differ greatly from adobos because US bbq sauces don’t foreground the flavor of the chile as the central focus. 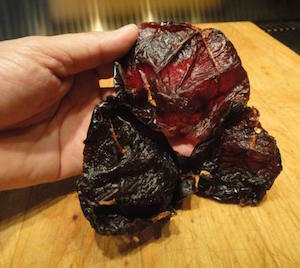 Chile Ancho is a dried Poblano chile, the basis of many moles, salsa, and adobos. Here it takes central stage, making a sauce that is perfect for any and all grilled or smoked meats. I’ve added piloncillo, the Mexican brown sugar that is made from sugar cane juice, cooked down to a solid stage, with no added chemicals. This Texas Mexican version of chile ancho adobo matches beautifully with holiday hams or a smoked pork loin like this one or barbecue spare ribs. Serve it as you would a mustard or other sauce. The first part is to make the chile puree that will be the base of the adobo. 1. Wipe clean and remove the seeds and veins from the chiles. 2. Place in a saucepan, add 4 cups of water and bring to a boil. Let stand for 10-15 minutes until the chiles are soft. Drain. 3. In a blender, place the chiles, garlic and water and blend on high until the puree is completely smooth. If small particles remain you can strain the puree through a fine mesh sieve. 4. In a sauté pan heat the Canola oil and then add the chile puree and cook for about 15-20 minutes until the puree thickens and the color changes. (Careful with the splatter) You’ll know it is properly cooked when, as in the picture, the spoon leaves a clean trail in the sauté pan. 5. In a sauté pan heat 1 Tbsp Canola oil and saute the diced onions and the celery until they are soft. 6. In a blender, place the sauteed onions, celery and 6 Tbsp of the Chile Puree. 7. Add all of the remaining ingredients and blend on high until completely smooth. Serve immediately or keep refrigerated for up to 6 days. You’ll find the taste to be sweet, pungent and aromatic of the ancho chiles. Really nice for a festive night or an afternoon barbecue. Try comparing this to other bbq sauces. Send me a comment and let me know how it turns out.